Works with Alexa: Search\"Smart Life\" in Alexa App for voice control LUXJET smart light bulb. App Remote Control: With \"Smart Life\" App, you can change your light colors and brightness and control your lights from anywhere at anytime. There are 8 scene modes to meet your entertainment needs. 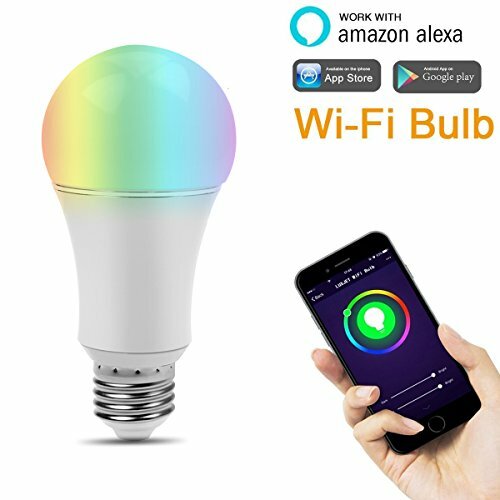 Multicolored Light Bulb: Over 16 million colors without hub required, you can customize the favorite color in your mood or choose the different scenes modes for your needs. Timer Setting: Schedule your bulbs on or off at specific time. Wake up in the morning with your favorite colors. Improve your home security when you\'re traveling by scheduling your lights on and off, giving the appearance that you\'re home. Electric Bill Saving: Using up to 84% less energy than traditional incandescent bulbs and last up to 20,000 hours making it a smart choice for energy conscious homes. Share the App with your family, both you and your family can control the sigle bulb or group bulbs.